Georgia Lamont, host of a late-night radio show in Seattle, is used to secret admirers. Her sultry voice gets lonely hearts through the night—especially during the holiday season. But this note—stuck to a single rose—has her spooked. Then you’ll be mine. Georgia doesn’t like the sound of that. Have you ever been awake at night when everyone—almost the entire world, it seems—is asleep? The world looks different in the dark, doesn’t it? It feels different, too. Somehow our fears, anxieties and insecurities seem to thrive in the shadows. The late night radio host understands the world of the dark. She knows about insomniacs, shift workers and night owls. With carefully selected music and her own specially chosen words, she reaches through the night and makes connections with these people. Georgia Lamont is the host of Seattle After Dark. She has a talent for connecting with her listeners. But what happens when she makes a connection with the wrong person? This is the question I asked myself when I began to write this story. But even as I began to explore the sinister side of the night, another question posed in my mind. What happens when she makes a connection with the right person--someone who needs her as much as she needs him? “It wouldn’t be Seattle After Midnight if we didn’t play a little Coltrane,” Georgia said. There were only ten minutes left in her show. Pierce had ended up parking on the shore of Lake Union. Now he wondered why he’d felt the need to seek out water when there was so much of the damn stuff in the air tonight. He’d lived in Seattle almost half his life, but every winter it always seemed like he’d never see the sun again. Georgia’s husky voice faded as Coltrane’s saxophone expanded into the nighttime airwaves. A sweet melancholy stole over Pierce, and he wondered, with something bordering awe, how she did it. How did this Georgia woman combine words and music, poetry and her simple stories, in such a way that she made him feel like he was alive again? How many other people in Seattle were listening right now? Men and women working the nightshift, insomniacs, the broken-hearted. Did they all feel the way he did--as if Georgia was speaking directly to them, her honeyed voice meant for only their ears? “That’s sweet. I’m glad you like the show." Pierce anticipated the song before it began, and when the soulful opening chords reached his ears, he felt again the aching longing that this show seemed to awaken in him. Slowly he cruised the length of Fairview Avenue, wondering about the guy who’d made that last call. What would incite someone to pick up the phone and to talk to a woman he’d never met--a woman who wouldn’t know him from Adam if she passed him on the street--and tell her things he probably wouldn’t tell his closest friend? Jeez. He was going crazy. Why couldn’t he stop fantasizing about someone he’d never met? He wasn’t that lonely. Or maybe he was. He stopped his car, realizing that by subconscious design he’d ended up outside the office tower that housed KXPG Radio. The five-story brick office building had a parking lot on one side and a coffee shop next to that. Across the street the still waters of Lake Union seemed like nothing but a silent, black pit. What was he doing here? Hoping to catch a glimpse of Georgia as she left the building for the night? Pathetic, he thought, but he kept his car parked right where it was, at a meter on the deserted street. Every night he felt as if she was speaking directly to him, when in fact she was reaching out to thousands. They’d never met, he was nuts to believe any sort of connection existed between them. “I’m sorry, but we’re out of time tonight—"
For the first time that night, possibly all day, Pierce smiled. The guy had nerve, at least. Georgia shared a final bit of poetry before signing off. Pierce had no interest in the radio after that, preferring silence to the insipid programming that followed Seattle After Midnight. He leaned his head against the seat rest, his eyes burning from fatigue. Logic told him to start his car and go home. But he didn’t. He eyed the outdoor parking lot next to the KXPG office tower and wondered which of the handful of vehicles sitting there at five in the morning might belong to Georgia. Oh, for Pete sake. Just go home, would you? He didn’t. And fifteen minutes later his tenacity was rewarded as a woman, who could only be Georgia, dashed out of the building. She wore a knee-length trench coat and held something that might have been a briefcase over her head to protect her hair from the rain. She was shorter than he’d imagined. And slightly more rounded, but it was hard to tell for sure with that bulky coat. In the glare of an outdoor street lamp, her hair glowed like soft gold. The security guard waved, then returned to his post inside the building. No sooner had the door swung shut behind him, than Georgia let out a scream. Georgia Lamont felt like a fool for screaming. It was only a rose tucked into the handle of her car, but when her fingers had closed over it, she’d felt one of the thorns dig deep into her thumb. She supposed she’d already been a little emotionally sensitive thanks to that last caller. Over the years she’d been in this business, both here and in South Dakota, she’d developed a sixth sense about the people who phoned in to talk to her. She could tell when someone was a little off, or had been drinking, or was just the obnoxious sort. But Jack tugged at her heart strings. She intuited deep sorrow in him. Too much sorrow for someone so young. Georgia brought her injured thumb to her mouth and tasted blood, then froze at the sound of footsteps slapping on pavement, moving fast, moving closer. A quick glance toward the street revealed a tall man in dark clothes running toward her. He didn’t seem to care about the rain, which drizzled down his dark hair and face, unchecked. He was coming to save her. Not attack her. Fear turned to relief, then to intrigue. Who was he? What was he doing here? “I’m fine, thanks. Just cut my finger.” She nodded toward her door, where the rose was still jammed under the handle. 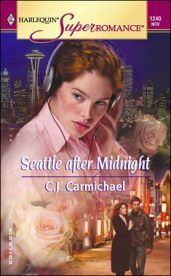 She wondered what he was doing out on the streets of Seattle at this time of night...actually, morning. Something about the way he carried his body made her think he might be a cop, but she’d seen the car he’d sprinted from and it wasn’t a patrol car. “I listen most nights,” he said. Lots of people told her this, and she always felt complimented. But this man’s confession gave her a different, much more unsettling reaction. How had he heard her scream from his car? Surely his window hadn’t been open in the rain? She tucked his card into the pocket of her trench coat and looked at him thoughtfully. He was still maintaining a respectable distance, his manner completely non-threatening. He was also slowly, but surely, becoming drenched. As was she. She turned back to the car door and that silly flower jammed in the handle. “Should I remove that for you?” Pierce Harding offered again. It took him only a moment. The thorns seemed to have no effect on him. “Really?” She hadn’t seen anything earlier. He unraveled something from the stem, then handed her a piece of paper, punctured in one place by a thorn. Then he removed the keys from her hand and unlocked the door and held it open. With the added light from the interior of her car, she could read the message easily. Georgia--A dozen roses... Then you’ll be mine. “Oh, my.” She thought of the guy who’d called her tonight. Jack. He’d asked to see her after her show. Was this from him? “From your boyfriend?” Pierce asked the question casually, but his dark eyes narrowed as he waited for her response. She didn’t have a boyfriend, but she wouldn’t tell him that. Not yet, anyway. There was something very attractive, almost compelling, about this man. But he was, after all, a virtual stranger. “This is probably from one of my listeners. Kind of sweet of him to come out in all this rain,” she said, trying to convince herself that it was, that there was nothing sinister in the phrase: then you’ll be mine. But no. Jack had sounded young and insecure, nothing like this self-assured stranger. “Maybe,” Pierce allowed. He stepped aside and gestured for her to get into the car. After a brief hesitation, that’s what she did, dropping her case to the passenger seat, along with the rose and the note. Pierce leaned inside to pass her the keys. His hand was wet and cold, just like hers. She smiled up at him briefly, uncertainly. He stood back for her to close the door, but she didn’t. Instead she peered up at him. He looked even taller from this vantage point. She noted his long, lean legs, and broad, powerful shoulders. If he’d intended to hurt her, he could have done so long ago. Besides, she was new in town and working nights made it difficult to meet people. How was she going to broaden her horizons if she wasn’t willing to take the odd chance or two? One thing she knew for sure. If she drove off now, she would never see Pierce Harding again. Somehow she couldn’t stand the thought of that. This man was strong, capable, attractive...in a lean, craggy way. But it was the hint of sadness in the tired lined that bracketed his mouth that tugged at her heart. In him she saw a different sadness than the one she’d sensed in Jack. A wiser, deeper, more pervasive sort of sadness. Pierce Harding looked surprised at first, which of course he would be. Women weren’t supposed to do things like invite strange men for coffee. Especially men who stepped out of dark shadows at the suspiciously right moment. But no way could this man be the same guy who’d called her station and left her the rose. Every instinct Georgia possessed told her that was impossible. He held out his hand and she didn’t hesitate to take it. If all went well, soon she’d know much more about this man than just his name. And if things clicked between them, she might even end up with a date.